Tattoo RW is the ultimate solution for your temporary badges and cards that require regular updates. It is the ideal solution to revise and reprint within seconds: visitor’s details on an access control badge, transit passes, passes for ski and holiday resorts, student IDs, membership cards with subscription details, loyalty cards with the updated number of points, as well as applicable special offers. With Tattoo RW, your cards are updated whenever required, while a same card can be erased, revised and printed anew up to 500 times. Tattoo RW is an Evolis card printer for single-sided rewritable cards. It effortlessly matches all your expectations when it comes to flexibility, affordability, sustainable development, and regular data updates. A ribbon-free technology - No consumables - Cards include a thermo-sensitive material that turns visible or vanishes depending on the applied temperature. The 300 dpi standard resolution and the large print area provide unrivalled freedom when designing cards. Enhance your cards with more texts and graphics (logos, barcodes). Its compact and sleek design makes it the ideal equipment to integrate and use in multiple environments: offices, reception desks, points of sale, etc. 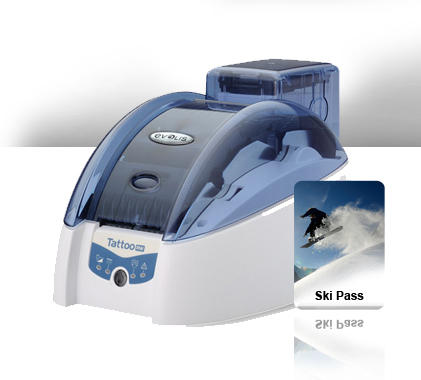 With the Tattoo ReWrite Card printer, you can generate or update loyalty cards, visitor badges or membership cards within seconds. Data can be edited on the spot and the same card can be reprinted or reused up to 500 times. The Tattoo ReWrite will help you save significant money since no ribbon is required and cards are reused, which makes it an environmentally sound solution as well. You can deliver a new card anytime it is required! The erase/write cycle is extremely fast and you can erase, encode, and reprint new data in a matter of seconds. Tattoo RW adheres to sustainable development. It uses rewritable cards and requires no ribbon: Tattoo RW helps you reduce your environmental footprint. Now with Tattoo RW, data encoded on magnetic stripes or on contactless chips can also be displayed and updated on the card surface. For example, loyalty points can be printed on a card and updated at each checkout.